When restorations, such as crowns, bridges and veneers, have been poorly designed and do not fit properly, cracking and damage can occur. Problems with the alignment of your bite can also cause restorations to fail. Additionally, restorations sometimes exceed their lifespan and may need to be replaced for that reason. 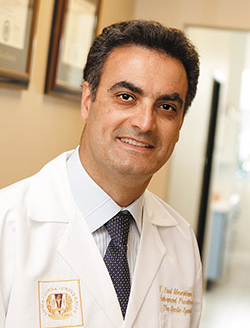 Dr. Meserkhani is a prosthodontist, a recognized dental specialist in aesthetic tooth restoration. He can replace or repair your damaged restorations for a comfortable fit, improved function and a beautiful, natural-looking smile. As a prosthodontist, Dr. Meserkhani has an additional three years of advanced post-graduate training in the aesthetic and functional restoration of damaged or broken-down teeth, and in the replacement of missing teeth. The aesthetic aspect of tooth restoration is an important part prosthodontics, and, while there is no officially recognized cosmetic specialty in dentistry, it is often considered that a prosthodontist is the closest thing to a cosmetic specialist. Dr. Meserkhani will restore your smile to its full beauty and function, and he will take your bite alignment into account when perform your restorative treatment. As a prosthodontist, he has an in-depth understanding of occlusion, and can restore your bite to correct alignment prior to providing you with new porcelain restorations. This ensures a comfortable fit and can prevent further problems. We have our own in-house dental lab where exceptionally skilled technicians craft our dental restorations under the direct supervision of Dr. Meserkhani. Our technicians and doctors are in very close communication during the restorative process, and patients can even communicate directly with their technician about their preferences in terms shape, size and color. We use the highest-quality porcelain materials to give your restorations a beautiful, natural look. Our work is lifelike and we’ll make sure that it complements your features, giving you a smile you will be happy to show. You can take advantage of our Complimentary Cosmetic Consultation to receive a personal consultation with Dr. Meserkhani and find out what treatment options are available to you. Give us a call and we will be happy to schedule your appointment.